Most of us have, at some point, watched birds in the sky and thought something like, “Man, I wish I could fly like that...” I certainly have. But have you thought about why birds fly in the first place? Taking to the sky is a pretty big evolutionary step! This week, we’ll take a look at how flight first developed in birds’ ancestors, why most birds are perfectly adapted for flight, the basic physics of bird flight, and some unique and notable types of flight. We’ll also briefly talk about other animals that fly, including insects, bats, and gliding animals. The preserved feathers of a tiny theropod dinosaur in a 99 million year old piece of amber. Image by R.C. McKellar, via Treehugger. The story of bird flight begins with feathers. Specifically, feathers on dinosaurs. A few years ago, scientists found a 99 million year old piece of amber in a market in Myanmar. The amber piece contained a feathered tail belonging to a tiny theropod dinosaur called a coelurosaur. The feathers are fluffy and not structured enough to be used in flight, but the tail was so well preserved that researchers could see the fancy brown-and-white patterning on the feathers. This means that the coelurosaur’s feathers were not meant for flight, but were more likely for warmth and display (to attract a mate). Over the next several million years, feathers for display would’ve evolved to become more elaborate and structured in order to stand up to the competition. Biologist Ken Dial's study of how young birds use their developing wings sheds light on the evolution of flight in birds. At the University of Montana's Flight Lab, Ken Dial has been researching the mechanics of bird flight. (Video from 2015, before the discovery of the tail feathers in amber). Cross section of a bird’s bone. Image from CNX OpenStax. Bird skeleton with the keel (sternum) highlighted. Image by toony & svtiste, modified from BIODIDAC. Eventually, the feathered theropods evolved into the modern birds we know and love today, which have some amazing adaptations that allow them to fly. Flight takes a lot of effort, and it’s essential to reduce weight as much as possible. Most vertebrates have pretty solid, relatively heavy bones, but birds have hollow bones that stay rigid through an internal lattice structure. They’ve also got a modified sternum (breastbone) with a keel - a ridge down the middle for anchoring strong wing muscles (some flightless birds like the ostrich and the kiwi have actually lost their keel because they don’t need it). Flying birds also have a tremendous amount of upper body strength relative to their size, and they’ve developed into aerodynamic shapes that allow them to move through the air with ease and efficiency. Let’s talk about physics for a bit. If you’re a bird (let’s say a sparrow), you’ve got 4 different forces to contend with: lift, weight, thrust, and drag. As you try to take off from a branch, you’ve got to generate enough lift with your wings to overcome the force of gravity, or your weight. Once you’re in the air, you have to have enough power, or thrust, to move forward, overcoming drag, or friction from the air you’re moving through. Fortunately, you’re small and light, and your wings are perfectly shaped to maximize lift and thrust (in a sort of elongated teardrop shape, viewed in profile). You can position your body horizontally and tuck in your feet as you fly, to minimize drag. As a sparrow, you can quickly angle your wings as you flap, allowing you to maneuver and dart with ease (unlike some of your larger cousins). 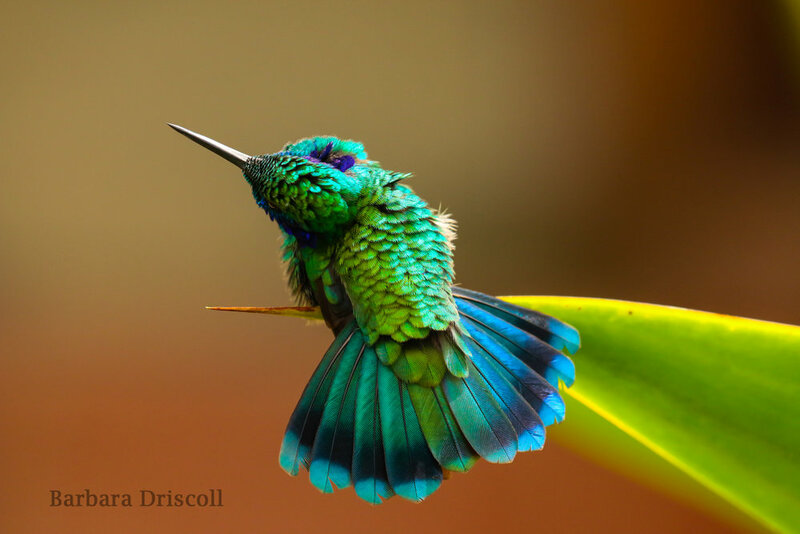 Green violetear hummingbird by Barbara Driscoll, winner of the Fine Arts category in the Audubon Photography Awards 2016. A wandering albatross over the southern Atlantic. Image by Liam Quinn. Those are the basics of bird flight, but of course, there are lots of different kinds of birds that fly in different ways. Owls, for instance, are stealthy predators that hunt at night, so they have tiny serrations on the leading edges (front) of their wings that make their flight virtually silent. On the other hand, some birds like snipes have more rigid structures in their feathers that actually create noise during courtship displays. Another unique flyer is the tiny hummingbird, which is specialized for hovering. A hummingbird’s wings beat incredibly fast - up to 52 times per second. On the opposite end of this spectrum we find the albatross, an enormous oceanic bird specialized for soaring long distances (up to nearly 1,000 km in a day on a good strong southern wind). Albatrosses rarely flap, need a good strong wind to generate enough lift to take off, and their wings are extremely long and and straight (not unlike the wings of a commercial airplane). And on the subject of taking off, have you ever seen a duck take off from a pond? Ducks are more adapted for swimming than they are for flight and don’t have the most efficient wing-to-body ratio, so they have to run on top of the water with the help of their wings (kind of like the juvenile birds in the video above) to get started. A bufflehead takes flight. Image by Russ. Fastest: the peregrine falcon, which can reach speeds up to 389 kph (242 mph) in a dive. Heaviest (that can still fly): the kori bustard, which can weigh up to 20 kg (44 lb). Longest migration: the arctic tern, which travels from pole to pole every year, a journey of over 19,000 km (12,000 mi). Largest wingspan: the wandering albatross, which measures up to 3.65 m (12 ft). Smallest: the male bee hummingbird, which weighs a mere 1.6 g (0.05 oz) and is only 5 cm (2 in) long (and half of that length is beak and tail). Bats’ wings are essentially hands, modified to the extreme. Image by Gabriel Ignacio Baloriani.